Lightweight meets light-speed in Team Daiwa's Steez High-Speed Baitcast Reels. Boasting a blazing fast 7.1:1 gear ratio and an ultra-light yet durable magnesium body design, the Steez High-Speed Reels offer bass fisherman the ultimate combination of lightweight performance and line-burning speed! Steez High-Speed Reels feature a free-floating, A7075 aluminum spool that starts up fast and spins longer. "This reel is one of the best reels on the market, its very, very expensive and the set up is $800+ for both the reel and rod. 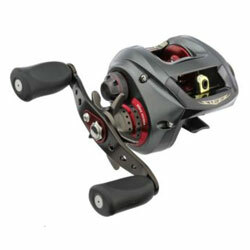 one of the fastest reel ratio of all baitcasting reels." "The Team Daiwa Steez sets the standard for others to follow. Its sleek design and lightweight combine to produce the most amazing reel I have ever used. Minus the price point, this is the best reel I have seen on the market as of yet." "1 word, "PERFECT", I know its $479 but worth the $$$ but dont ever touch one and especially dont touch one mounted on a steez rod unless you are ready to spend at least $800 for the rod and reel combo." According to the general online consensus, where our research is based on unbiased customer comments and user feedback, this is an outstanding reel and outstanding value for the money. There were few, if any, negative reports on this reel.